Solar Power System - How does it work? Needless to say that the Sun is the biggest source of renewable energy for the Earth. The fact is that even though the earth receives only a part of the energy generated by the Sun (i.e. Solar energy), that part of solar energy is also tremendously huge. The Earth receives solar energy in the form of light and heat. But in today's world, the words 'power' and 'energy' are leaned more towards 'electricity'. This article explains how electricity is harvested from the solar energy and how it is utilized. Electrical energy can be harvested from solar power by means of either photovoltaics or concentrated solar power systems. Photovoltaics directly convert solar energy into electricity. They work on the principle of the photovoltaic effect. When certain materials are exposed to light, they absorb photons and release free electrons. This phenomenon is called as the photoelectric effect. Photovoltaic effect is a method of producing direct current electricity based on the principle of the photoelectric effect. Based on the principle of photovoltaic effect, solar cells or photovoltaic cells are made. They convert sunlight into direct current (DC) electricity. But, a single photovoltaic cell does not produce enough amount of electricity. Therefore, a number of photovoltaic cells are mounted on a supporting frame and are electrically connected to each other to form a photovoltaic module or solar panel. Commonly available solar panels range from several hundred watts (say 100 watts) up to few kilowatts (ever heard of a 5kW solar panel?). They are available in different sizes and different price ranges. Solar panels or modules are designed to supply electric power at a certain voltage (say 12v), but the current they produce is directly dependent on the incident light. As of now it is clear that photovoltaic modules produce DC electricity. But, for most of the times we require AC power and, hence, solar power system consists of an inverter too. According to the requirement of power, multiple photovoltaic modules are electrically connected together to form a PV array and to achieve more power. There are different types of PV systems according to their implementation. PV direct systems: These systems supply the load only when the Sun is shining. There is no storage of power generated and, hence, batteries are absent. An inverter may or may not be used depending on the type of load. Off-grid systems: This type of system is commonly used at locations where power from the grid is not available or not reliable. An off-grid solar power system is not connected to any electric grid. It consists solar panel arrays, storage batteries and inverter circuits. 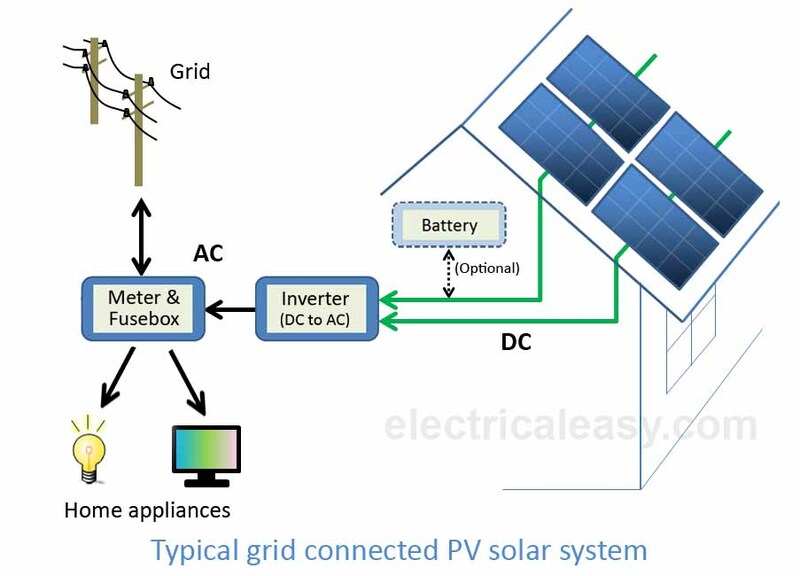 Grid connected systems: These solar power systems are tied with grids so that the excess required power can be accessed from the grid. They may or may not be backed by batteries. As the name suggest, in this type of solar power system, sun rays are concentrated (focused) on a small area by placing mirrors or lenses over a large area. Due to this, a huge amount of heat is generated at the focused area. This heat can be used to heat up the working fluid which can further drive the steam turbine. There are different types of technologies that are based on the concentrated solar power to produce electricity. Some of them are - parabolic trough, Stirling dish, solar power tower etc. 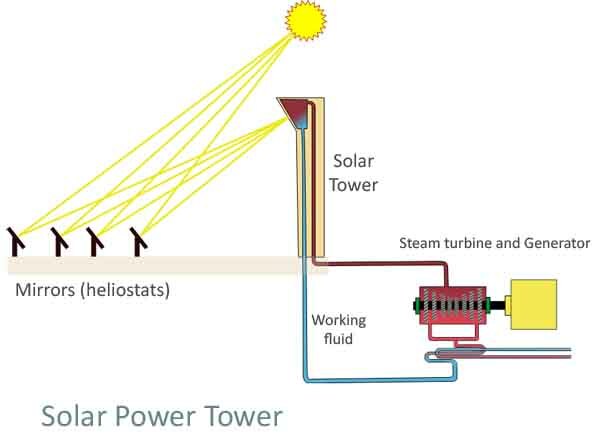 The following schematic shows how a solar power tower works.